Asphalt sealcoating and crack filling ensures that you not only prevent the need to repave, but you extend the value of your original investment considerably. 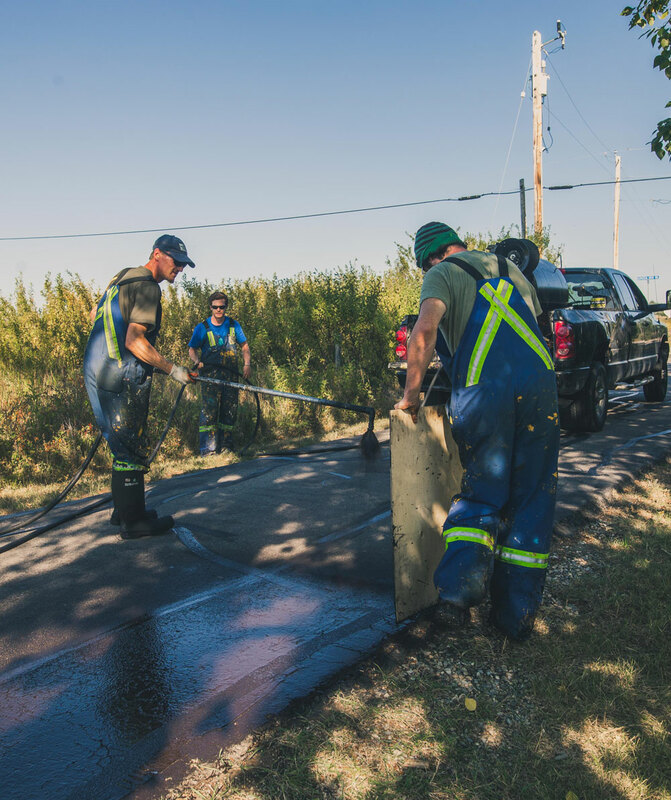 The process of asphalt sealcoating involves spraying an asphalt-based waterproofing material over the surface that seals cracks, and prevents water seepage which causes potholes and cracks. It also makes the asphalt look brand new with a crisp black-top look. Asphalt crack filling is the procedure of filling in cracks in the asphalt to prevent further water deterioration. 75% of untreated pavement cracks become potholes. Maintenance allows for the subgrade base to be protected and remain stable which will further the life of your pavement. Committing to yearly crack filling maintenance cycles is the best way to protect your investment. How does EverLine Coatings and Services provide consistent, great service across the country? There’s two major ingredients, great people and a high code of values. When you connect those two together you have something special. We’ve discovered our driven principles act as our guideline for how we act, how we train, how we hire and how we service our clients. It keeps us accountable to each other, to our clients and has us improve ourselves to remain leaders in our field. We’re dedicated to giving all of our effort, respect, expertise and attention to our clients, our stakeholders and each other every day. We’re resourceful by constantly innovating to provide better solutions. We are integrity focused through working with honesty, purpose and delivering on our promises. We are value-based by operating at all times according to our values of respect, sustainability, mutual support and community enhancement. We are excelling the set standards of communication, credibility, professionalism and quality for our industry, and will continue to lead in all ways possible. We are nourishing our employees by providing an environment that is fun, friendly and encourages the achievement of their full potential. At EverLine Coatings and Services we are unmatched in experience and expertise when it comes to asphalt sealcoating and crack filling. No matter the job or surface you need sealcoated or filled our professionals can help. Whether it is a parking lot, driveway or street we have the equipment and products to protect and extend the longevity of your asphalt surface. Our sealcoating and crack filling services have many benefits including slowing pavement deterioration considerably, adding traction, improve ride quality, helps your surface look like new, minimizes the effect on the environment in the long run and saves your business money. If you are receiving crack filling or asphalt sealing services from EverLine Coatings and Services in the near future, there are some steps you can take to prepare. Preparing your asphalt surface will help us complete our work in an efficient and timely manner. At EverLine project pricing is determined on a per-job basis. Depending on the volume, difficulty, traffic and materials being used on site pricing can fluctuate. To ensure the best pricing we require a detailed summary of your project and a budget you need to work within. If you are interested in receiving a quote on a project you are interested in having done please contact us. We have worked within a wide variety of budgets and can work with you to find pricing that will work for your business.